Originally conceived back in the ’60s, this sequel to the classic Disney film abounds in nostalgia yet sadly lacks what has made the original 1964 film so beloved and enduring, the overwhelming lycharming sense of magical wonder. 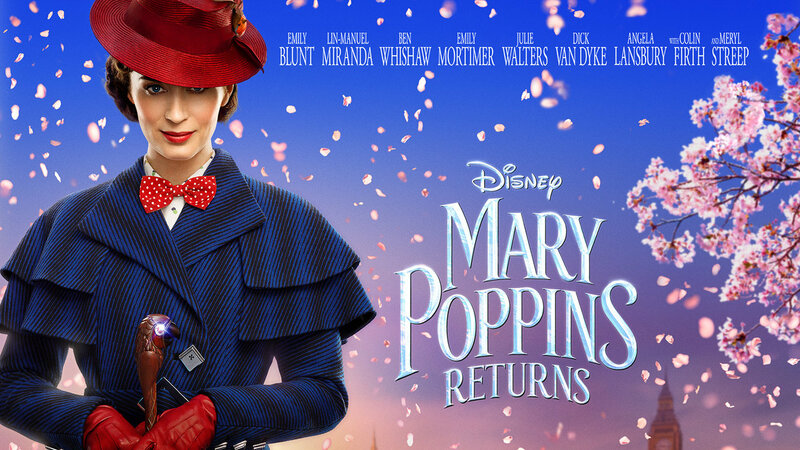 Mary Poppins (Emily Blunt) spontaneously reappears on Cherry Tree Lane when widower Michael Banks (Ben Whishaw, ‘Paddington’) finds his home is at imminent risk of repossession by the bank, plunging himself and his three young children into worrying uncertainty. Honestly, I left the cinema feeling distinctly underwhelmed after seeing this. Now, I can’t discount that I saw it in a cinema I was trying for the first time and the venue while charming was a little underwhelming itself in some ways. The seating was not particularly comfortable and we were seated too far from the screen, so I feel it likely that if I saw this again in a better setting it would be a little (or a lot) more effective as there’s so much to like about it. Hard task to make a sequel to such a beloved classic, especially so many years (54) after the original with a new cast taking on the old roles. Emily Blunt is the ideal choice for the lead role, though I found her Mary a little colder than Julie Andrew’s version of the character. I must disclose that I am a huge fan of Lin-Manuel Miranda, there’s not a day that’s gone by for about a year that I haven’t listened to something written by him, his book is on the shelf just arm’s reach from me now as I write this. So, every bit of the film with him in it, and he’s there from the opening, had my attention and in a good mood. He is the Bert of the film, a lamplighter who remembers Mary from her first time around. His warmth and fondness of Mary is abundant, which helps a little to offset her perceived coldness, though there are moments where you see that Rob Marshall is torn between giving him the room to take the character to a greater level and not letting him dominate to the detriment of the eponymous character, he could, nay would, steal the film if given the chance, sadly he’s not given that chance. The other casting includes Ben Whishaw as adult Michael Banks, apparently unrecognisable from being the voice of Paddington as I checked with my friend’s son and he told me he sounds nothing like Paddington. Emily Mortimer as adult Jane is equally good, nothing to dislike there. Another ‘Paddington’ star, Julie Walters stars as the family housekeeper who has been with them since they were children, maybe an obvious casting choice but again there’s no reason to complain because Walters is as wonderful as ever. Every bit of the story and each new song felt like it was a substitute for something in the original. Like they listed the characters, scenes, and songs, then wrote some form of replacement for it. One piece that does work very well is the animated scene, where the characters jump into a hand-drawn world of talking animals. This works so well because it makes beautiful use of the classic Disney style animation, though the strong sense of nostalgia is probably most effective on parents and adults who grew up with that era of Disney. None of the original songs from the original film are reprised, all songs are new compositions. I immediately knew the reason for not using the old score or songs, though parts of Marc Shaiman’s score do resemble familiar parts of the original composition, it’s all new to make everything Academy Awards eligible. That plan worked, both the score and one song ‘The Place Where Lost Things Go’ are nominated for Oscars, though I don’t rate their chances. I didn’t find the songs very earwormy and I like to come out of a musical film singing the songs and wanting to listen to the soundtrack when I get home, so while they were very nicely written, nothing has stuck with me more than the odd littlest line or melody. This odd sticking to the original film’s formula leads to a scene with Meryl Streep where her character serves absolutely no purpose to the narrative except to be this film’s Uncle Albert, a crazy relative with a weird house who ends up uncontrollably hanging out on the ceiling and singing a song about it. She features in just one scene, where the children leave a precious item in her care for repair, yet they never seem to return to collect it, showing that the character is just there for the sake of it. Her inclusion seems to just be that they had Meryl Streep attached to the film and needed to keep her role in the film because, well, she’s Meryl Streep. If it was any lesser actor, and if they didn’t seem to feel the need to have an analogue for everything in the 1964 film, the scene would have been cut out, no question. I’m not the only person I know who saw this and felt underwhelmed, though I did generally enjoy the experience and there’s very little about the film that I actually dislike. Maybe I just wanted to be wowed considerably more, swept up in the charm and excitement of the film. I wanted to have my world turned upside down in a great way just as the children do by Mary coming into their lives. That’s a feeling everyone who sees this film wants to experience again, a childlike sense of wonder and amazement. I’m sure it could have that effect, it seems to have had it on some people including lots of critics and online reviewers. I’m more than happy to give it another chance, though it’ll have to be when it is available to watch at home, maybe in the more comfortable setting with my sound system turned up to fully immersive levels it might affect me more in the way I hoped it would the first time. It has been pointed out that there are eight books by P. L. Travers from which sequels could be developed, Rob Marshall has confirmed a third film is already in early development stages. My big concern here is that it could be a case of ever diminishing returns unless they have something overwhelmingly wonderful to bring to the series. Nominated for 3 BAFTAs including costume and production design, it won none of them last night. I don’t think the chances are any better that it will walk away with any of the 4 Academy Awards it’s nominated for in a couple of weeks. I don’t think this is the last we will see of this Mary Poppins, Disney will most likely take it to a trilogy but unless they pull something incredible out of the carpet bag, I expect that’s where it’ll end. This entry was posted in BAFTAs 2019, featured, Film, General, Oscars 2019 and tagged 2018, 2019, award, awards, BAFTA, BAFTAs, comedy, Disney, family, fantasy, film, films, golden globes, lin-manuel miranda, movie, movies, sequel. Bookmark the permalink.